I received a really neat item for review recently. I have to tell you ahead of time though that I like it just as much for how beautiful it is as I do how well it works. This mini lamp from buy IScentU is simply gorgeous. I love how dainty and feminine it looks, but not only is it pretty, it is useful. This little bottle is a fragrance lamp. Now, with three dogs, one cat and 6 children, I often have odors in my home that I need to deal with. (Like wet dog, a litterbox that is due for a cleaning, dirty socks, etc.) So, I tried the IScentU Lamp and Fragrance. Apple Splash is the scent I received. It smells wonderful. Light and crisp. So, Here is how this little lamp works. You fill it approx. 1/2 to 2/3 full of the Scentier Lampe Parfum (This is the fancy name for the fragrance oil.). The lamp came with a little funnel to make filling easier. Also it is recommended that you put a plate or saucer under the lamp while filling the lamp as spills could damage finished surfaces. Insert the Platinum Wick into the lamp. Allow the lamp to sit about five minutes with the cut-off cap on so the wick has time to absorb the fragrance. Now, you can light your IScentU Lamp. This lights differently than a stone burner as it heats up without a visible flame. Remove your cut-off cap and hold your flame to the side of the Platinum Wick. Not the top. If a flame is seen, gentle blow it out. Place your decorative Crown Cap on top and enjoy. Here is a youtube video from IScentU on lighting your lamp:http://www.youtube.com/watch?v=XcLT3hDIHEI&lr=1 Always make sure that the lamp is set in a safe place. It only took moments for my family to notice the fragrance filling the room. They do recommend that you do not use longer than 1/2 hour at a time as the fragrance can become overwhelming. I was very pleased with my experience with the IScentU Lamp. As stated previously, it is not only pretty, it is functional. I could no longer smell damp dog after using the IScentU product. IScentU Lamps come in many colors and designs. There will be a match for just about any decor you have in your home. There are also many fragrances to choose from. I am hoping to try some other fragrances in the future! Maybe Lavender Fields or Eucalyptus Mint. Take a glance around the buyIScentU website and leave a comment here if you find one you especially like! Disclosure:I received no monetary compensation for this post. I did receive an IScentU lamp and fragrance for review purposes. All thoughts and opinions are mine. Tropicana Pure Premium 100% Florida Orange Juice sure brings back memories. I was born in Florida, and although we moved around quite a bit, my family always returned there. 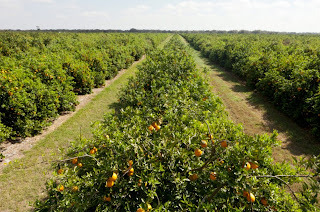 So, I grew up around Florida orange groves. I can remember as a family going on the weekend to the local orange grove and spending hours picking oranges. Other than babysitting, it was probably my first paying job. One day while out picking we had an exciting experience. We usually stayed together around one tree as a family and then moved on to the next tree. We usually picked the lower oranges and then someone came after us with ladders and did the ones higher up. On this day just minutes after moving on to another tree, we heard the pickers behind us give a shout. One of them raced to his truck and grabbed a shovel. We went back to see what was happening and they had just killed a rattlesnake. Right near where we had been picking. It didn't scare us enough to leave, but I sure was careful the rest of the day. It was amazing to me how many oranges we could pick in a day and yet there was always more. Which leads right into my next thought! Let me tell you a little bit about Tropicana. 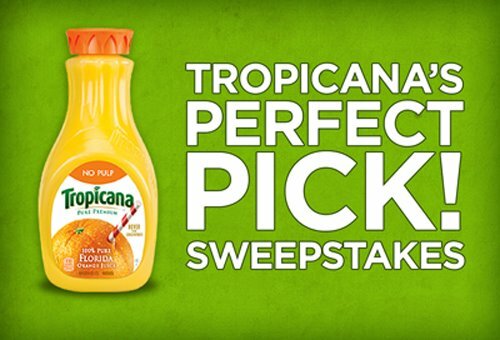 Tropicana is the single largest buyer of Florida fruit and the Tropicana Pure Premium is 100% pure Florida orange juice. They purchase approximately 11.6 billion oranges from Florida each year! Not hard to believe since oranges have been grown in Florida since the 1560s. Tropicana uses groves in 22 different Florida counties, mainly southern and central Florida. Who knows, maybe an orange or two I picked made it into Tropicana Orange Juice! There are two major types of oranges used in Tropicana Pure Premium. They are Valencia and Hamlin. The Valencia being more intense in color and flavor, while the Hamlin tends to be sweeter. 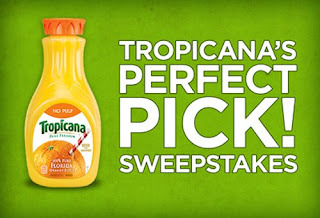 So hurry up enter Tropicana"s Perfect Pick Sweepstakes. Then be sure to pick up some Tropicana Pure Premium for breakfast..or lunch....maybe dinner...or just anytime you want the fresh taste of Florida oranges. Do any of you like to design with photos and then share them with your friends? There is this really neat App on Facebook called PhotoPad where you can change your Facebook photo albums into a scrapbook. 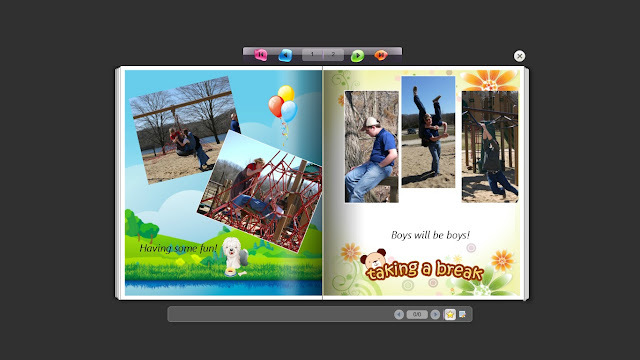 It features, different backgrounds, picture layouts, text, shapes, and stickers. You can design and redesign until you get exactly what you want, and then you can share with your friends on Facebook. Have any of you tried this app? It is really quite simple to use, so I was pretty excited to get to try this out, especially since I have been using my new camera and sharing the pictures on Facebook! This makes them look even better when you share them! You can see one of my designs above! We had so much fun that day! If you would like to try your hand at designing on PhotoPad just visit the link:https://apps.facebook.com/photopad/ Hopefully my neighbors will enjoy PhotoPad as much as I did. I do hope they add some more features. I would love to see more shapes for the photos, and of course more stickers! If you use PhotoPad be sure to leave a comment and let me know what you think! Disclosure:This is a sponsored post. All thoughts and opinions are entirely mine. I've been collecting cute kitchen utensils for years now. I haven't' always used all of them. For years I much rather preferred to just look at all of them and admire them than actually use them. But I've actually been getting my hands dirty in the kitchen this year and haven't looked back. But I've been looking down a lot at all the flour and ingredients that I've spilled all over myself. So it's time to finally invest in an apron and I was looking through some possible purchases for them when I saw the websitedebtsettlementfamily.com/procedure. After I looked through it a little bit I decided to get some more info on it and possible use it to help with my debt issues. I saw this cute ruffled apron online that I instantly fell in love with. Just because it's protecting my clothes doesn't mean that it can't be attractive itself! From my cute kitchen stuff, you can tell that I'm not against something cute that also performs a necessary function too. Actually, I love those things even more! Good News Neighbors! Children's Claritin Mom Crew! With spring here allergies are beginning to kick in. My son and 2 of my daughters each suffer from seasonal allergies. So do I! 3 of us are allergic to dust and mold, and I personally react to pine. Then of course there are perfumes and such. Since we suffer from allergies I am happy to tell you that I have been accepted to the Children's Claritin Mom Crew! What does that mean to my neighbors here At the Fence? Well, it means that I will be able to give you updates, hints and tips, and sometimes product received directly from Children's Claritin. Not to mention all the other Mom Crew Members! We already use Claritin, so this will be great actually working with them and the rest of the Claritin Mom Crew. So keep on the lookout for updates on Claritin and ways to help beat your children's allergies. Start taking Claritin® allergy products as soon as symptoms start. Having medication on hand will help you prepare for allergy symptoms. When you understand what triggers your allergy symptoms, you can make an extra effort to avoid them. For example, grass pollen levels rise when grass is disturbed, so if that's one of your triggers, wear a mask when mowing or avoid mowing altogether. Neighbors, do any of you have children who suffer from allergies? If so, be sure to "Like" the Claritin Facebook page so you can stay posted on Claritin news and to save on Claritin. It is that time of year again. Springtime means the return of pests. Including the pests that bother your dog, like ticks, fleas, mosquitos, biting flies and lice. 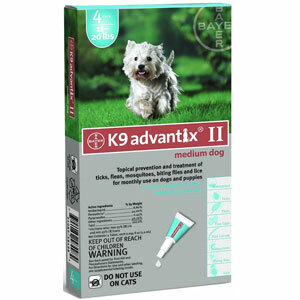 So I am really excited to find that I can purchase K9 Advantix II through Vet Depot, right online! We have never yet had a problem with fleas and ticks, and I don't want to! Vet Depot brings discount pet supplies directly to your door. Talk about convenience. The K9 Advantix II is available for all size dogs, but the ones we received are for dogs 11-20 lbs. and it is a 4 pack. The price is $48.67. It is a topical prevention and treatment for the pests that most bother your dog. The K9 Advantix II is easy to use. Just open the foil package and remove applicator and tip. Hold applicator tube and remove cap and follow directions to break seal. Apply evenly in two to three spots on the dog's back, between the shoulder and tail. Be sure to part the fur to apply the K9 Advantix II. Apply evenly. Remember as with all medications, please follow all directions. They have to have her out on our long lead for play because this little stinker escapes our chain link fence! They were watching volleyball here! Knowing about Vet Depot is going to be a great convenience since we have 3 dogs, a cat and 1 bird. I can shop online since there is no nearby pet store here. We have to drive an hour or more to find anything other than Wal-Mart. Vet depot carries more than just flea and tick control. They carry a wide variety of pet supplies. Be sure to visit their site and see if they can help you out any. Disclosure:I received no monetary compensation for this review. I did receive K9 Advantix II for review purposes. All thoughts and opinions are mine.